Hello! We are your friendly Bookings Team. Email us with any practical query regarding bookings, venues, attendance or timetables: ResearcherDevelopment@admin.cam.ac.uk. I'm Dr Elizabeth English, the University of Cambridge Mindfulness Practictioner, and I teach the mindfulness courses here. You can contact me with questions about practising or learning, mindfulness@admin.cam.ac.uk - or check our website for an immediate answer: click here for FAQs. We run studies into mindflness for students. 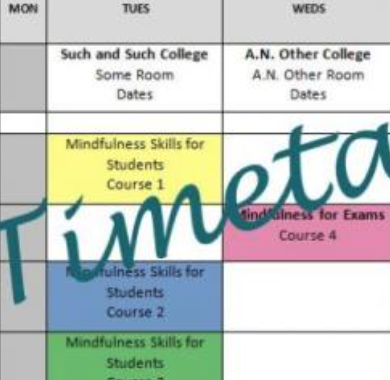 Please go to the Mindful Student Study pages to discover more, or contact the study team if you wish to be involved in future projects: mindfulstudentstudy@medschl.cam.ac.uk, or 01223 746090.